If you didn't already know Francheska Snyder is the head gardener at Shofuso Japanese House, that fact becomes glaringly obvious the minute she begins talking about her craft. Bring up hori-hori knives and her eyes begin shinning. Mention bamboo brooms and her voice gets giddy. On a balmy Wednesday afternoon, we sit by the veranda of Shofuso and talk about gardening. Dressed in long sleeves and a gardening hat, she walks us through her toolbelt, her daily routine, and the ways in which gardening has changed her life. I have my bachelor’s degree in biochemistry, which is just a completely different background to come from as a gardener. But I grew up on a farm, and I was always surrounded by nature. When I graduated I started working for the university that I got my degree at, doing fundraising. And I was in an office with no windows and I just couldn’t take it anymore. So in my free time I would volunteer at free public gardens and taking classes. I started working for a landscaping company part-time, just to learn some industry standards. I was gardening on my own and had my own clients but I figured I should do something kind of on the books. And then I just decided I was going to change my career… and I ended up in Philadelphia. I had experience but I had never been a full gardener before. And this just kind of happened for me and changed my life. There was a Japanese garden at the site before the house came here [after it was exhibited at the Museum of Modern Art.] The house was originally built for that exhibit. So when the exhibit was over, it stayed on the east coast because there is not a ton of Asian influence in this region as opposed to California or other places in the West Coast. And because there was already a Japanese garden at this site, it kind of made sense. So then the garden was then redesigned around the house, by the same man who designed the house in the museum. Shofuso is a residential garden, which means that the garden really looks back at the dwelling or the house, and in that way the two spaces interact with each other. If you put a different structure in a space, you have to consider what it looks like from different rooms. You know, it’s not a botanic garden, so you’re not going to see a huge variety of plant types or the newest cultivar. It’s nothing like that. It’s supposed to be an ease of a garden. I look at the Fairmount Park archives to find photographic evidence of features in the garden. We have the original garden plan but it was never fully implemented on site, so we just don’t know how far the plan got. So, when we're adding stones or making changes we have to consider some elements. Is it a historic feature? An aesthetic feature? A safety feature? The tea garden, for example, is something we’re going to change. Tea gardens should have an inner and outer tea garden, and it’s a very delicate, quiet place. But we have thousands of visitors in a weekend, so it can get quite chaotic sometimes. So as far as changes, that is actually one thing I’d like to see. Mostly we focus on creating space in the trees and trying to enhance natural features of the trees [as they were originally planted]. Definitely the morning. The morning is absolutely the best time. Sometimes it can be a little bit wet, but I do love the morning, right before it gets hot. Because even if it gets a little cooler by the late afternoon, you’re likely tired by then. Midday is awful. And I’m always wearing long sleeves and pants to protect myself against the sun. I’ll usually take a mid-morning break, a lunch break and then a mid-afternoon break, so you’re just focused on your work for those periods of time and then you know that a break is coming up. Sometimes we have visitors who come in and just sit on the veranda for hours. We have a small waterfall, and I think people are really drawn to the sound of water. It’s really relaxing. Sometimes if you can’t find me I will be tucked in that the stream, moving rocks around so that the stream is audible. There’s research going on right now where people are talking with Japanese garden craftsmen and asking this question. And nobody wants to answer it. It’s a huge question. There are elements of a Japanese garden: they all have water or some representation of water, they have stone, and they have green plants, which could be moss. They are variations, but they always have those three elements. I think it’s because you’re in a natural setting. You know, everyone’s so busy, doing their jobs and living, but they are distracted from what living actually is. And being in nature, I think, is living. You know, you’re around trees and animals, you’re not in a building or a car. So I think a garden is really a place to relax. We’re able to come, have fun and enjoy ourselves outdoors, but ultimately it’s really a place to come, sit down, and take in that moment. Everything is very detailed and deliberate, even the way I have to clean tools and the way I have to shear. There’s a right and wrong way to do it. It demands attention to detail, everything has a specific purpose. I’ve gardened in other places and they feel easy, really, after here. When I’m here it’s like I’m improving myself as a craftsperson. I’m following these necessary steps to become a craftsman. After gardening I just look at things a little bit differently. I’ve been in this little Japanese garden world now for three and a half years. And I think I’ve really just looked at the relationships of different things differently. I don’t really know how to describe it. I feel like the gardening practices that I’ve been doing have filtered into other parts of my life. Everything has a specific purpose. These are actually bonsai shears for cutting leaves and bonsai branches. I think this fits into my hand really well, and it is very strong and sharp. They have other circle scissors – I’m not sure what the name is in Japanese, but I’ll learn by the day of our workshop (laughs). 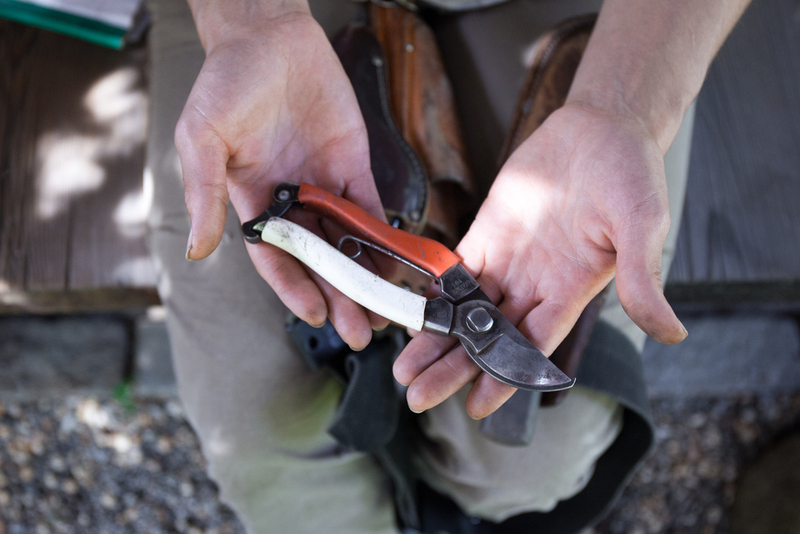 These are handmade and they’re always on my right hand hip- they’re my go-to tool. I try to use this a lot, unless I’m cutting something thicker than my thumb. It’s really beneficial to use this when you’re doing pine pruning and have to get between the needles without cutting them. These are my bypass pruners. Pretty much any gardener has a set of these in whatever brand they prefer. These are Okatsune- a lot of my tools are Okatsune. They’re kind of small, but I’ve got sort of small-ish hands. I can cut anything with this –if anything is bigger than two of my fingers, I would have to use my saw. I would say this is my second most-used cutting tool. What’s really neat about the Okatsune tools is that they have red and white markings on the handles of their tools. The white is so that if you’re gardening in the early morning or late afternoon and you drop your tool on the ground, you can still see it in the dark. And the red is very visible in the daytime. Those colors really pop against the green grass. This is really dirty- you can tell I was working! This is my hori-hori knife. I use this a lot, it’s on my belt anytime I’m walking around the garden. It’s really a multipurpose tool: you can use it to weed, you can use it to dig holes for transplanting, it has a little bit of serration here so you can use it to cut grass... it’ s a good-back up to have if you’re walking around the garden and see things you want to move. You can use this serrated part to dig things up, like a little trowel. So it’s not just a knife, it’s a real tool. Hear more from Francheska at our Shofuso x Rikumo gardening workshop, coming up this Sunday, June 5th at 2pm. For more information and to register, click here. .